Could Climate Change Shut Down the Gulf Stream? The 2004 disaster movie “The Day After Tomorrow” depicted the cataclysmic effects—superstorms, tornadoes and deep freezes— resulting from the impacts of climate change. In the movie, global warming had accelerated the melting of polar ice, which disrupted circulation in the North Atlantic Ocean, triggering violent changes in the weather. Scientists pooh-poohed the dire scenarios in the movie, but affirmed that climate change could indeed affect ocean circulation—could it shut down the Gulf Stream? The many ocean currents and wind systems that move heat from the equator northwards towards the poles then transport the cold water back towards the equator make up the thermohaline circulation. (Thermo refers to temperature while haline denotes salt content; both factors determine the density of ocean waters.) It is also called the Great Ocean Conveyor, a term coined in 1987 by Wallace Broecker, Newberry Professor of Geology in the Department of Earth and Environmental Sciences at Columbia University and a scientist at Lamont-Doherty Earth Observatory. Broecker theorized that changes in the thermohaline circulation triggered dramatic changes in the North Atlantic during the last ice age. In the high latitudes, the cold water on the surface of the ocean gets saltier as some water evaporates and/or salt is ejected in the forming of sea ice. Because saltier colder water is denser and thus heavier, it drops deep into the ocean and moves along the depths until it can rise to the surface near the equator, usually in the Pacific and Indian Oceans. Heat from the sun then warms the cold water at the surface, and evaporation leaves the water saltier. The warm salty water is then carried northwards; it joins the Gulf Stream, a large powerful ocean current that is also driven by winds. The warm salty water travels up the U.S. east coast, then crosses into the North Atlantic region where it releases heat and warms Western Europe. Once the water releases its heat and reaches the North Atlantic, it becomes very cold and dense again, and sinks to the deep ocean. The cycle continues. 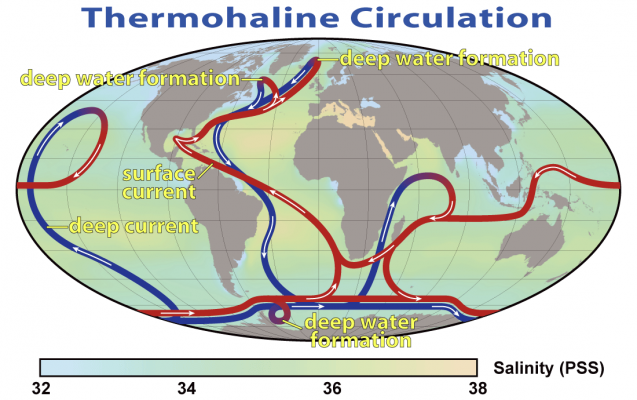 The thermohaline circulation plays a key role in determining the climate of different regions of the earth. The Atlantic Meridional Overturning Circulation, part of the thermohaline circulation which includes the Gulf Stream, is the ocean circulation system that carries heat north from the tropics and Southern Hemisphere until it loses it in the northern North Atlantic, Nordic and Labrador Seas, which leads to the deep sinking of the colder waters. Because the thermohaline circulation is mainly driven by differences in the water’s density, it depends upon the cold dense waters that sink into the deep oceans. Global warming can affect this by warming surface waters and melting ice that adds fresh water to the circulation, making the waters less saline; this freshening of the water can prevent the cold waters from sinking and thus alter ocean currents. As the planet warms, more and more fresh water is entering the system. In 2016, the extent of Greenland’s melting sea ice set a new record low. That May, the Arctic lost about 23,600 square miles of ice daily, compared to the long-term average loss of 18,000 square miles per day. A study by Marco Tedesco, a research professor at Lamont-Doherty specializing in Greenland, and colleagues suggested that a reduction in the temperature difference between the polar and temperate regions (the Arctic is warming twice as fast as the rest of the planet) pulled the jet stream air currents northwards. The warm moist air it carried hovered over Greenland, causing the record melting. Michael Mann, Distinguished Professor of Atmospheric Science at Penn State University, one of the study’s authors, noted that if the Atlantic Meridional Overturning Circulation were to totally collapse over the next few decades, it would change ocean circulation patterns, influence the food chain, and negatively impact fish populations. We would not return to very cold conditions, however, because the oceans have taken up so much heat. Another 2015 study that modeled a hypothetical slowdown or collapse of the Atlantic Meridional Overturning Circulation concluded that a collapse could result in widespread cooling throughout the North Atlantic and Europe (though this would be somewhat mitigated by global warming), increased sea ice in the North Atlantic, changes in tropical precipitation patterns, stronger North Atlantic storms, reduced precipitation and river flow as well as reduced crop productivity in Europe. These effects would impact many regions around the globe. 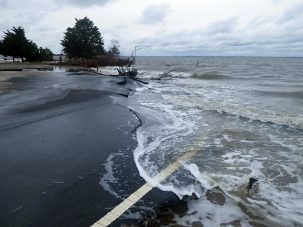 Sea levels are rising fast at Assateague in MD and VA.
Sea levels would be affected as well. Currently sea levels are lower on the U.S. east coast because waters east of the Gulf Stream, closer to Europe, are warmer and expand, so sea levels there are higher. If the Gulf Stream is weakened, the temperature differential between the two sides is reduced, so sea levels will rise on the west of the Gulf Stream along the U.S. east coast and the North Atlantic. In fact, sea levels along the coast and the Gulf of Mexico are rising faster than in any other part of the U.S, and some data suggests that it is because the Gulf Stream has already begun to slow down. Other research attributed a jump in sea level rise from New York to Newfoundland from 2009 to 2010 to the Atlantic Meridional Overturning Circulation slowing down 30 percent in the same period, as well as unusual wind currents that pushed ocean waters towards the coast. Not all scientists agree that the Atlantic Meridional Overturning Circulation is slowing or that if it is, the phenomenon is caused by human induced global warming. A 2016 study suggested that while a great deal of fresh water has been discharged from Greenland, it’s difficult to track what happens to it because of eddies and currents. 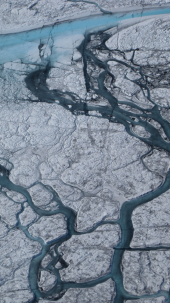 This research concluded that most of Greenland’s meltwater moves southward, and what remains of the fresh water is not enough to affect the Atlantic Meridional Overturning Circulation. 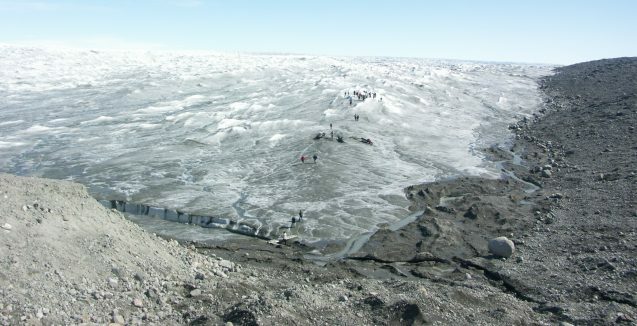 The scientists did acknowledge, however, that the ongoing rapid melting of Greenland and increases of fresh water could eventually affect it. The bottom line is that the thermohaline circulation is a very complex system and scientists do not yet understand all the variables involved in how it functions. There is an ongoing debate about why the Atlantic Meridional Overturning Circulation has weakened and how much is due to the effects of human activity on the climate. 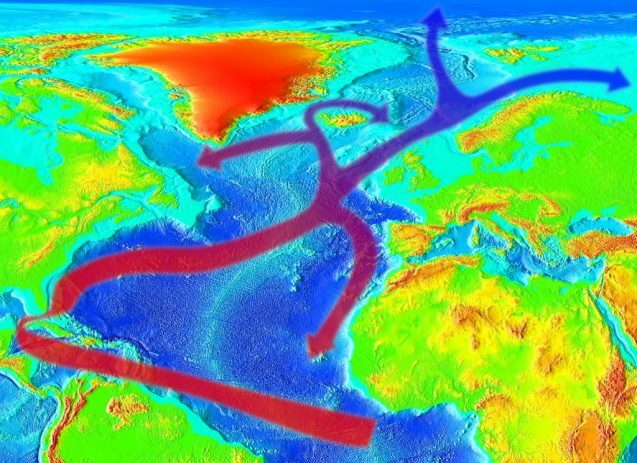 In the Earth’s past, scientists have seen evidence of large inputs of fresh water into the North Atlantic from melting glaciers and ice caps as well as changes in the thermohaline circulation during transitions in and out of glacial periods. 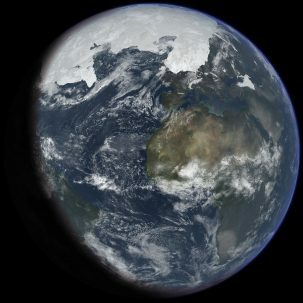 Global warming could potentially cause a thermohaline circulation shutdown and subsequent regional cooling, but because Earth will continue to warm as a result of greenhouse gas emissions, it would not produce another Ice Age. If the thermohaline circulation shut down, cooling would likely occur only in regions that are currently warmed by the ocean conveyor. And even if the thermohaline circulation did shut down, winds would still likely drive the Gulf Stream; however, there would be less warm water from the tropics and the Gulf Stream could become cooler and not reach as far north. Lamont-Doherty’s Arctic Switchyard Project explores the circulation, variability, and driving mechanisms of the fresh water arriving in the Arctic Ocean, north of the eastern Canadian Archipelago and Greenland.